Your wedding ceremony will be one of the most memorable moments of your life and the reception is where friends & family will come together to celebrate the occasion! The Abbey is a beautiful facility offering several outdoor ceremony sites, the chapel & the event center to help make the celebration memorable! We offer individualized wedding consultation to help plan a party that fits your style & budget. You can expect individual attention, customized menus & an on-site wedding coordinator to help your event go smoothly, so you can enjoy the day. Congratulations on your engagement! Next comes planning your “unique” wedding. Here at the Abbey Events Complex we know that a beautiful wedding is a memory that will last forever. 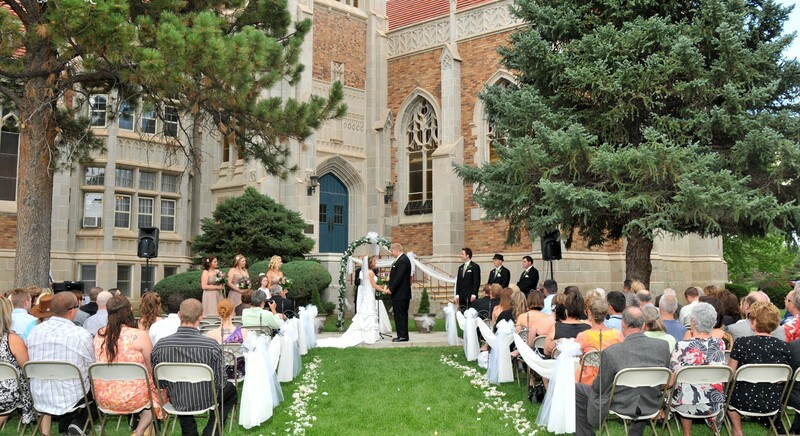 We offer a picturesque historic facility for your ceremony and a beautiful modern facility for your reception. Our beautiful campus offers an abundance of wedding photo opportunities for your photographer to capture that special moment in your life, in an idyllic setting. The historic monastery is surrounded by tall, majestic trees with manicured lawns and dramatic architecture. The Abbey offers individualized wedding ceremony and/or reception consultation to help plan an event that fits your style and budget. The Abbey is ideal for indoor and outdoor wedding ceremonies. Ceremonies may be held indoors in the Abbey Chapel with its soaring ceiling, large stained glass window, stone pilasters with the twelve apostles making a beautiful atmosphere for your wedding. Or your ceremony may be held outside in front of the picturesque monastery and bell tower or in the more intimate grove to the west of the monastery, the choice is yours, really the outdoor choices are boundless. The chapel is available as a backup alternative to your outdoor wedding in case mother nature is not cooperative. Dine and dance with your guests in the tasteful Benedict or Abbots rooms in the Event Center building. The Benedict room can accommodate up to 275+ and the Abbots room up to 70. You can expect individual attention to help your reception to go smoothly, complimentary services, customized menus and our on-site coordinator services to ensure your day is stress-free. Our on premise catering staff provides great tasting food with outstanding service at a very competitive price. Wedding ceremonies together with wedding receptions at the Abbey Events Complex are perfect for couples that prefer the convenience of having their wedding guests travel to a single location. The Abbey’s experienced wedding professional will work together with you to create a seamless, stress-free event. Our goal is to make your wedding dreams come true! At The Abbey we will do our very best to guarantee your complete satisfaction. Our goal is to exceed your expectations and make your event memorable and gratifying. We are committed to excellence and will go the extra mile to gain your trust and repeat business. Our purpose is to provide our clients with an exceptional product with quality service at a very competitive price. The Abbey will do what we say we will! There is no substitute for putting the specifications in writing. The Abbey will present a written document “Event Agreement/Proposal” for your approval. We provide our services 7 days a week at any hour of the day. We take great pride in taking unexpected last minute orders. Our normal office hours are from 8:00am to 5:00pm Monday thru Friday. We can accommodate consultation appointments on weekends and after hours for your convenience.